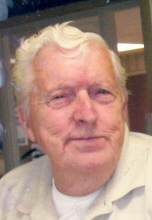 PEORIA--William “Bill” B. Carpenter, 88, of Peoria, died peacefully with his wife at his side in their home at 6:57 P.M. on Sunday, November 18, 2018. Bill was born November 8, 1930 in Peoria, IL to the late William H. and Mildred (Woods) Carpenter. He married Beatrice Baldovin on January 11, 1952 in Morton, IL. Bill was a multi-faceted man whose fate was sealed when he was born a Carpenter. He was very skilled at his trade and was a proud member of the Carpenter’s Union Local #183 Peoria. He built the home in which he and Beatrice have lived for decades. The house brought him great pride which he showed every year when he sanded, stained, and varnished the garage door. Bill valued learning and looked to books to expand his knowledge, especially in history and electronics. If books were not enough, he loved to “pick your brain” in conversations, absorbing all he could on any subject. When computers became available Bill had another information source which he embraced wholeheartedly. Bill was not really a techie or nerd though, as is demonstrated by his passion for American luxury and classic vehicles. He owned a prized Harley Davidson motorcycle. Among his other favorites were the 1948 Buick Roadmaster, the 1959 Cadillac Series 62 Convertible and a few Lincolns. As for size, though, the winner was the GMC Motor Home. Bill and Bea became active members in the GMC 6 Wheelers, a club of owners of the classic GMC Motor Home. Many memories and friendships were made as the couple traveled the country in the 26 foot “cruising castle”. Obviously, Bill enjoyed being a traveling man. Bill and Bea visited all 50 United States. In their travels they also went to Australia and New Zealand and enjoyed a luxury cruise in the Caribbean. In addition, he spent many hours in his favorite reclining chair watching old classic movies while drinking a milk shake or his favorite, Ensure. Nieces and nephews can remember going fishing with Bill while his friends will remember the fun he had from playing poker, especially when he was winning. To know Bill is to also know his kind heart. He was a generous man and a man who loved animals. He got pleasure from visiting with neighbor and family pets, especially dogs and cats. He sat by the window so that he could watch the delicate humming birds feeding and the songbirds splashing. He chuckled at the antics of squirrels challenged by the feeding contraptions he built for them. However, closest to his heart were the stray cats that he and Bea took in. There were several over the years which included Funny Face, Babe, and Momma Mia, a pregnant cat who was named for giving birth to 5 healthy kittens. Bea and Bill could not part with the kitties so they kept them all and named them for their favorite country western singers. As members of the Friends of Strays in Princeton, IL Bea and Bill have helped to rescue, rehabilitate, shelter and adopt out many, many little animals. Bill is survived by his beloved wife, Beatrice, of 67 years, whom he adored, and by generations of nieces and nephews including, Randal Robinson, Tom and James Muscarello, Anna Marie McNally, Patti Muscarello, Glen, Richard and Robert Stephenson, Sharon Whisenant, Terri Morandi, Dennis Brewer, Linda Bell, Karen Skrovinski, Joe and Bud Baldovin, Marlissa Osborn, Debbie Weeks, Bryan, Barry and Brad Baldovin, Cara Oertle, Teresa Ritter, Raeann Johnson, Doug Glader, Danny Baldovin, Vicki Sayre, Dennis Robinson; several great and great-great nieces and nephews and by many dear friends. We will miss Bill’s strong and meaningful handshake. Bill is preceded in death by his parents, his sister Donna Carley and lots of cherished kitties. Services will be held on Saturday, November 24, 2018 at the Wilton Mortuary, 2101 N. Knoxville Ave., Peoria. Visitation will be at 1 P.M., followed by the funeral service at 2 P.M. Rev. Howard Love will officiate. Entombment will be private at American Mausoleum in Peoria. In lieu of flowers, memorials may be made to Friends of Strays, P.O. Box 315, Princeton, IL 61356 or to UnityPoint Hospice, 221 NE Glen Oak Ave., Peoria, IL 61636 Attn: Hospice. "Email Address" would like to share the life celebration of William B. "Bill" Carpenter. Click on the "link" to go to share a favorite memory or leave a condolence message for the family.